Fine art, Illustration, graphic design and the art philanthropy of Sam Morrison: That Ain't Right. I recently went to a local "antique store" to waste some time while waiting for someone. I put "antique store" in quotes because any place calling itself an antique store should NOT have a poster of Billy Ray Cyrus for sale. That immediately demotes it's classification to thrift store. (Yeah, I know Billy Ray is probably considered an antique by now...) But for the last 13 years I've always used the Billy Ray Cyrus poster as my litmus test. And It's served me well. 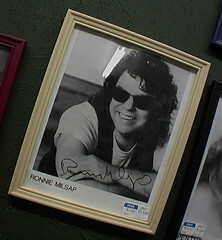 Anyway, I'm strolling around the store and was amazed to discover an autographed photo of Ronnie Milsap. Now I don't know much about country music but, I do know he was somewhat of a pioneer in that genre. So I stood in stunned amazment thinking that his autograph is probably worth some bucks... and it was... approximately five of them. FIVE BUCKS!!!???? That's it!!!??? While I recovered from sticker shock and pondered the instability of fame I continued looking around when a stack of old books caught my eye. Now on that stack of old books there was a TV Guide. The TV Guide looked really out of place. At first I thought maybe the store owner accidentally put it down while helping a customer. (Also note, thrift stores will often have a TV where you can find the owner watching their soaps...antique stores don't). 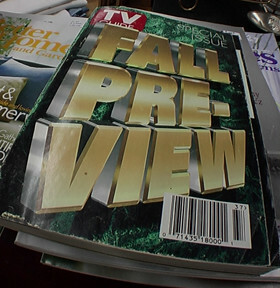 So as I attempted to move the TV Guide out of the way I accidentally grabbed it's cover. While grabbing the cover I unwittingly began to reveal a pale green post-it-note on the inside front page. On that post-it note was a $7.00 price tag. $7.00!!!!! 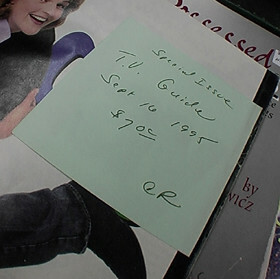 Since when is a 1995 Fall Special TV Guide worth more than a signed autograph of music pioneer Ronnie Milsap!!!!???? Actually, keep an eye open there's an issue of tv guide that was only published in the midwest, who's cover was done by Bernie Wrightson. It was for steven king's the stand tv movie or some such thing - it's on my innactive hit list.